The Russian poet Andrei Gorchakov, accompanied by guide and translator Eugenia, is traveling through Italy researching the life of an 18th-century Russian composer. In an ancient spa town, he meets the lunatic Domenico, who years earlier had imprisoned his own family in his house for seven years to save them from the evils of the world. Seeing some deep truth in Domenico's act, Andrei becomes drawn to him. In a series of dreams, the poet's nostalgia for his homeland and his longing for his wife, his ambivalent feelings for Eugenia and her Italy, and his sense of kinship with Domenico become intertwined. Through a carefully balanced fusion of sight and sound, skilled directors are often able to elicit specific emotions in their work. Even beyond any ties to traditional concepts of storytelling, a particular mingling of images and music can convey a powerful sense of meaning, using atmosphere to evoke deep feelings of joy, sadness, and anger. 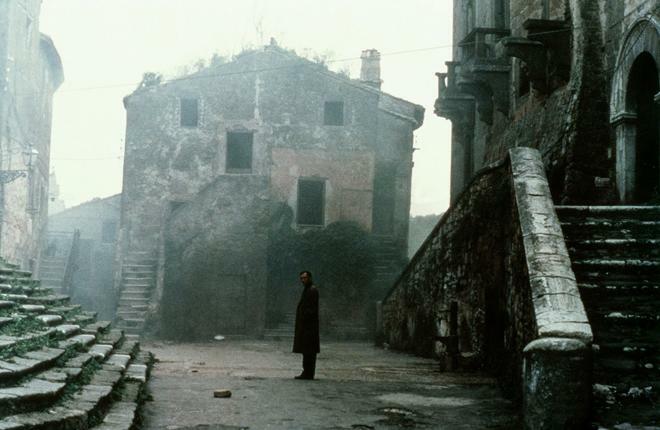 In the case of Andrei Tarkovsky's 1983 drama, 'Nostalghia,' the celebrated Russian filmmaker uses this tactic to take on the wistful sentiments of longing and melancholy -- giving striking visual form to the aching pull of lingering nostalgia. Mysterious and hypnotic, the movie offers a dreamy and ambiguous rumination on isolation and madness, filled with a palpable yearning that is never quite satisfied. The loose story follows a Russian poet, Andrei Gorchakov (Oleg Yankovskiy), who has travelled to Italy to complete research for a biography on an 18th century composer. While staying in a hotel, Andrei befriends a former mental patient, Domenico (Erland Josephson), who once imprisoned his family out of fear for their survival in the outside world. Drawn to the lonely man's apocalyptic musings and somber demeanor, the writer begins to recognize shades of himself within the seemingly crazy outcast. Meanwhile, tensions rise between Andrei and his Italian translator, Eugenia (Domiziana Giordano), as the woman grows increasingly frustrated by their unrequited attraction toward one another. Now homesick and alienated, Andrei struggles to complete his work while an odd request from Domenico lingers in his mind. Though vague elements of traditional drama can be found throughout the script, the emphasis really isn't on narrative beats. Instead, the runtime focuses on mood and images, creating a dreamy aesthetic that perfectly engenders a tragic sense of estrangement and yearning. Marked by many of Tarkovsky's trademark sensibilities, the movie's style is contemplative and faintly abstract. Long takes and slowly reframing camera movements that leisurely flow throughout locations are the norm, leading to a hypnotic and deliberate tempo. This extension of screen time and screen space helps to draw out the alienated atmosphere and pensive rhythm of the story. Under Tarkovsky's drifting lens, it's almost as if the characters cease to exist when they are no longer in the frame, perfectly evoking their own deep longing and isolation. Compositions feature a painterly sense of symmetry and the movie is often cast in an underlit tinge of gray shadows. Occasional black and white flashbacks and slow motion dreams sequences all add to the desolate tone as well, and these dalliances into memory and conjecture increasingly blur together, distorting the line between reality and fantasy. Water also plays a huge part in Tarkovsky's somber vision, with gently flooding locations and pattering raindrops becoming repeated motifs throughout the film. 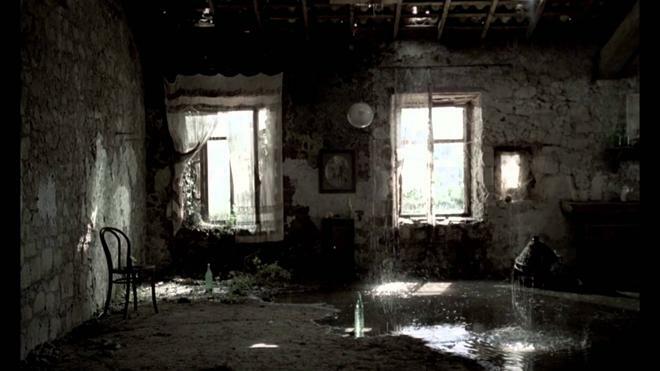 One scene set in a decaying house littered with bottles slowly filling with falling rain is particularly striking, and a later sequence set in an old cathedral drowned in water proves to be equally arresting, creating a tearful world constantly soaked in sorrow. All of these gloomy visual touches work together to evoke a singular sense of melancholy -- and even when literal meaning becomes elusive within the script's plot and themes, this overarching emotion remains clear, cohesive, and utterly moving. Complementing Tarkovsky's images are a series of ambiguous philosophical ruminations that the characters engage in from time to time. These discussions address concepts dealing with art, religion, existence, sanity, unity, and loneliness, resulting in a decidedly oblique but still thought-provoking intermingling of ideas. Likewise, despite the movie's vague narrative construction, there are a few intriguing dramatic crescendos -- including a powerful speech made by Domenico near the climax and a surprisingly gripping concluding sequence that follows Andrei as he tries valiantly to fulfill a promise that he made. On the surface, the scene simply follows the man as he attempts to carry a lit candle across a drained pool, but the emotional associations tied to the act coupled with Tarkovsky's single take presentation, become unexpectedly absorbing. Really, the same could be said for the entire runtime as well, as the director is able to transfix his audience into an almost brooding trance. By the time its incredible final shot fades from the screen, only shades of the film's meaning are in focus, but the underlying emotions of the experience are palpable. Fully living up to its reflective title, 'Nostalghia' engenders a mournful air of exile and yearning -- a yearning for something long since lost and forever indefinable. The movie's unconventional approach and slow pace will likely alienate many viewers, but in this case, a sense of alienation is actually intentional. In fact, it might be paramount to the experience. 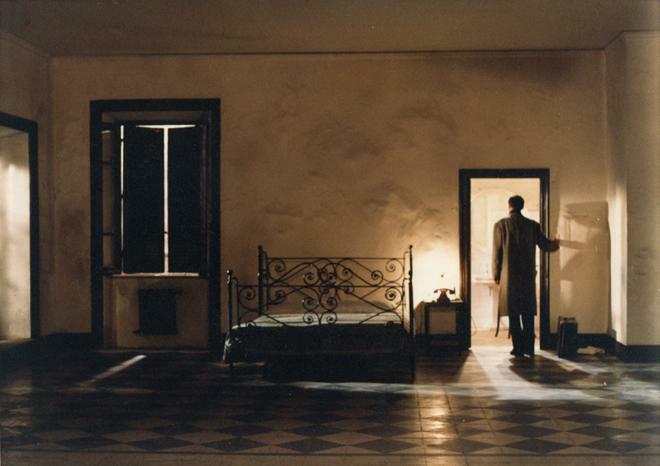 Kino brings 'Nostalghia' to Blu-ray on a single BD-50 disc that comes housed in a keepcase. After some logos and warnings, the disc transitions to a standard menu screen. The packaging indicates that the release is region A coded. The movie is provided with a 1080p/AVC MPEG-4 transfer in the 1.66:1 aspect ratio. Showing clear signs of age, this is a decent -- but occasionally lacking -- image. The source print is in adequate shape, but there are frequent specks and other moderate signs of wear visible throughout. Grain is apparent as well, but it can look a tad noisy in certain instances. Clarity is on the soft side, and isolated scenes feature a slight lack of fine detail. With that said, there is some solid dimension and texture in certain shots, and Tarkovsky's powerful imagery remains rather stunning. Contrast is relatively low, and the picture has an intentionally dark and drab quality that favors grays. While this leads to a notable lack of pop, this nearly colorless approach works perfectly to bolster the movie's melancholy intentions. Black levels are deep and consistent throughout and there are no major digital artifacts to speak of. The print is a little rough and the chosen aesthetic leads to a comparatively soft sense of clarity, but the transfer is still respectful, and Tarkovsky's images are undeniably powerful. The film is presented with an Italian/Russian LPCM 2.0 track along with English subtitles. Like the video, the audio also shows clear signs of age, resulting in a serviceable, but unimpressive mix. Dialogue is relatively clear but carries a comparatively thin quality. Likewise, there are notable instances of background hissing/static along with some occasional pops throughout. Thankfully, while frequent, these issues don't ruin the audio, and the film's subtle sound design still shines through. Isolated effect like falling rain, footsteps, creaking doors, and distant birds help to enhance the movie's somber tone. Though music is sparse, a few classical compositions feature solid range. Balance between all of the audio elements is handled well. The level of background hissing and static is unfortunate, but speech remains perfectly audible and the design work is delicately powerful. Theatrical Trailer (HD, 3 min) - The film's trailer is included in 1080p with LPCM 2.0 sound. Andrei Tarkosky's 'Nostalghia' is a powerfully abstract meditation on longing and isolation. Aspects of its plot might remain elusive, but its slow and dreamy aesthetic create a striking sense of emotion and ambiguous meaning. While the video and audio both demonstrate clear signs of age, the disc's technical presentation is still decent. Unfortunately, though, the only supplement we get is a trailer. The movie's challenging approach won't be for everyone, but this is a complex and moving piece of art house cinema. Worth a look.